View our most recent medical construction work with this turnkey project for a new HDU (high dependency unit). 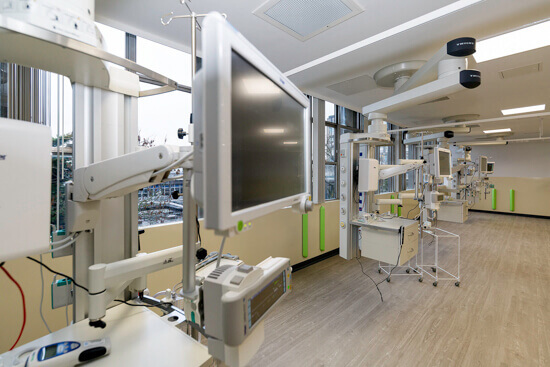 Hiltons provided Northwick Park Hospital in London with a brand new intensive care unit that fitted their requirements. We delivered a full turnkey solution for their hospital construction work as a comprehensive design and build package. We worked with them from the initial plans, including 2D and 3D images, through to the final hand-over of a working health care suite. View our video to get a glimpse into both the process and the quality of delivery that Hiltons provide with every client. Every turnkey project we undertake comes with its own set of unique requirements and unexpected obstacles. Our years of experience allow us to handle any challenge with ease and professionalism. 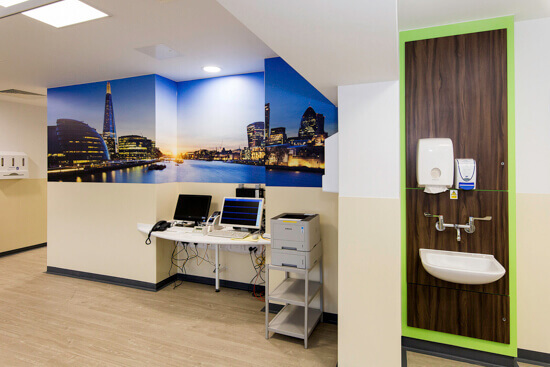 With Northwick Park Hospital, we met the short time scale (both the lead time and 4 month delivery) with confidence. The other challenges that were uncovered during hospital construction, such as discovering the need to open a structural wall, did not delay completion time nor the quality of work. The final ICU and HDU met the NHS’s high standards and expectations. Our team are experienced not just in standard construction challenges, but in working in the busy hospital environment. The work on Northwick Park was undertook beside a live ward with patients moving near to the project area. This everyday challenge is something with which our team are accustomed to. By maintaining strict health and safety policies, as well as simply being friendly and respectful, this proximity with busy hospital life has never been a problem during any of our projects. Hiltons offer a comprehensive range of medical equipment and services. This includes battery backup and emergency lighting, electrical repairs and maintenance, full turnkey solutions (see our video below), medical lighting, and pendants. 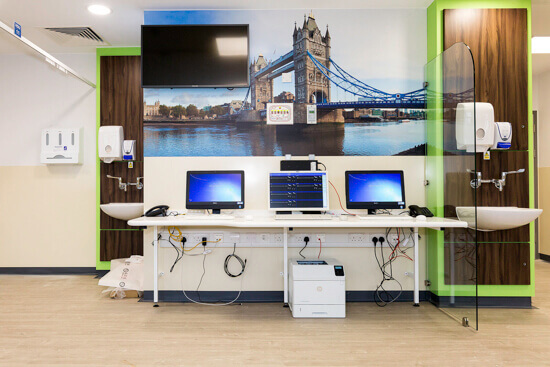 Our team are respectful and experienced in bringing electrical services to busy hospital areas. We meet deadlines and are aware of the ongoing functions of the hospital environment. We follow health & safety and UK standards to ensure consistent delivery of the highest quality work. We provide all types of electrical work in schools, shops, offices and industrial / commercial buildings. This includes bespoke designs and customer-driven work, right through to energy-saving alternatives and turnkey projects. Our experienced and qualified technicians not only install electrical equipment, but also offer electrical servicing and maintenance. All our team take pride in their work, meaning that you can trust us to provide electrical solutions that meet every one of your requirements. Hiltons are a reliable and professional company, delivering cost effective and efficient services. We not only meet all our clients’ expectations, but go beyond the standard: we are friendly, flexible and experienced, providing electrical and medical solutions that work and last. We have been in this industry for over twenty five years and in that time have built a reputation for excellence. Always aiming to provide the most cost effective services, you, our client, are at the centre of every project we undertake. As well as turnkey solutions, Hiltons are specialists in a range of medical equipment. We have been working in medical electrical services for over twenty years, giving us the range of experience required to be leading experts. 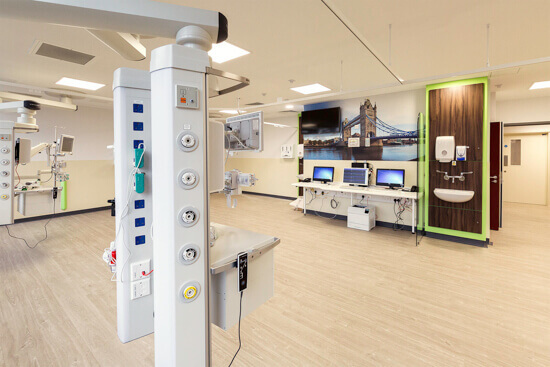 If you need medical electrical equipment, including pendants and lighting, you can trust us to provide products and services that deliver in excellence. We are committed to you, our customer, and pride ourselves on bringing you the best. 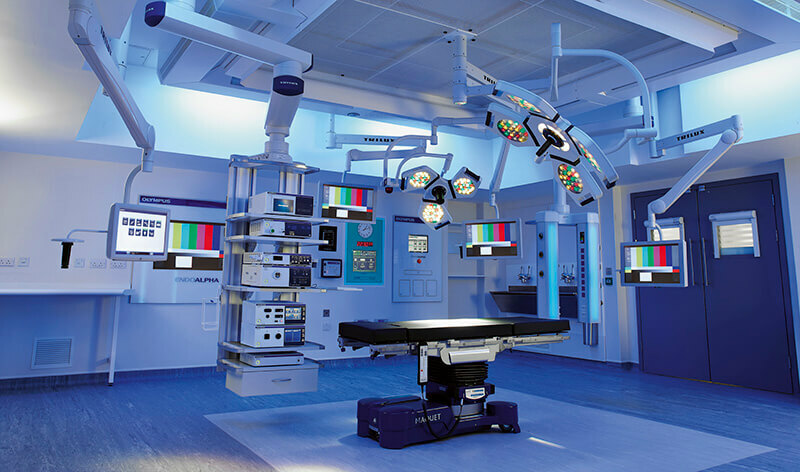 Our LED medical lighting is suitable both for operating theatres and examination rooms. Every light that Hiltons offer has been tailor made for the medical industry. We use Trilux products, offering the best ease of use, energy efficiency and design. The LED bulbs prevent the build-up of heat, keeping the lighting both safe and comfortable for your staff and patients. 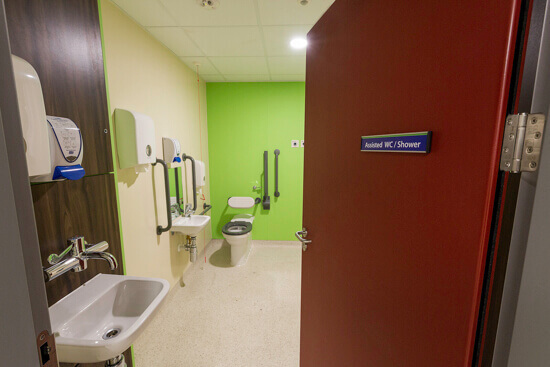 As our lights as designed specifically for hospitals, they match the needs of any standard medical centre. This means clear, white light and fully adjustable movement to enable your staff to provide the best care. We also provide medical pendants for various hospital suites and areas, including those for intensive care units. Trilux also design these pendants, along with our LED lights. They provide high quality electrical equipment with flexible designs. Our many variations of pendants offer outlets of gas and power with different column options. These include ceiling suspension, free-standing columns and double-arm systems. They include gear trays, drawers and more to ensure your staff have easy access to all equipment. Our various pendants enable you to provide everything from primary care to complete. If you want high quality medical electrical equipment, there’s no better source than Hiltons. As well as supply and fitting, we also offer maintenance and breakdown recovery services. We enable you to provide excellent health care.